Keeping in mind the sensitivity of the age of the young ones where they know some facts but have a great quest to learn and know more. Their imaginations are vast and they have the capacity to relate with the people and things around them. 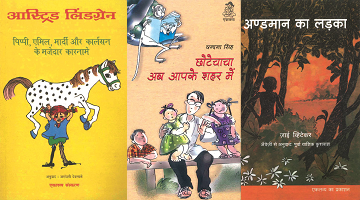 To make their curiosities more interesting Eklavya had woven some set of books which will answer their questions intelligently and enlarge their knowledge. Ganga has been flowing through this land for aeons. And thousands of people have walked along her ba..
Read to enjoy the fun-filled, adventurous story of a courageous girl Aditi, an elephant Sundari, and..
Aditi and friends are on a mission in Australia. Everyone is excited, but the elephant is upset. She..
Next in the series, Aditi and friends receive a mysterious letter from Rohit and Roshan, seeking urg..
An official visit to Prague takes a strange turn. The naughty granddaughter of Princess Libusha cast..
Goldie the dragon is missing! Aditi and friends follow a clue and reach Cumae, Italy where Goldie wa..
Aditi’s grandmother is unwell, and there is a certain rose that may make her feel better. The quest .. In Budapest, Hungary lives a changeling (a little creature who keeps changing into whatever anyone t..
अदिति के नाना-नानी पश्चिमी भारत की एक छोटी-सी रियासत के शासक हैं। वह उन्हीं के साथ रहती है। उसके दोस.. Become a part of the amazing Jarva tribal community residing in Andaman Island, and experience the s..